We were down at the communal dining at 7 am and it was still dark out. While waiting for breakfast, we ventured on the terrace and the view was incredibly dramatic! We missed that last night. But as it was freezing, we headed back indoors. I could imagine that terrace full on summers though with a comfortable chill. After breakfast, we were herded back to the coaster. Our driver is a stickler for schedule and we might have stressed him out a bit by being constantly the last ones to board. At least we were consistent. 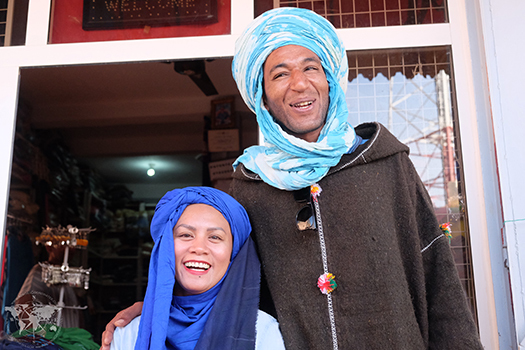 After an hour or so of driving, we stopped at a roadside and a berber named Ali came to meet us. 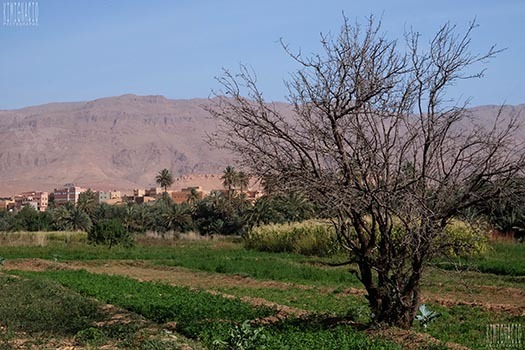 He will be our guide in the valleys of the thousand Kasbahs as we passed olives and dates plantations to reach the village of Tinghir. 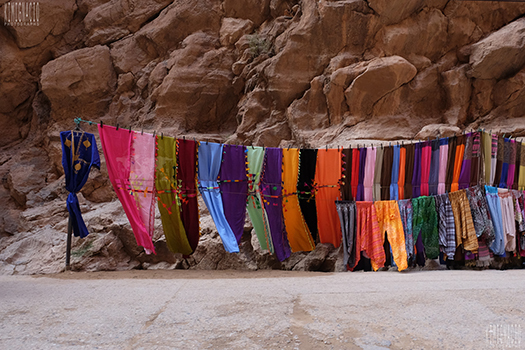 In Tinghir, we visited a carpet seller where we got rolled out not only a red carpet marhaba (welcome) but all sorts of hand-woven colors. They were all exquisite but no one in our group was in a market for carpets. 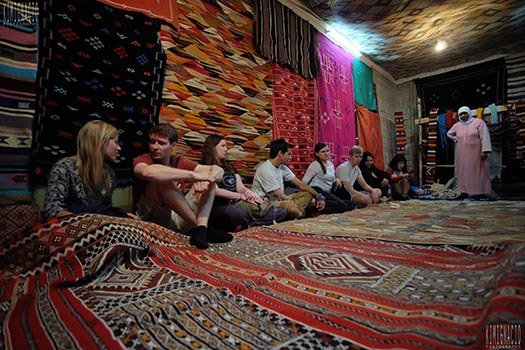 It was just in the 2nd leg of our multi-city tour and we were planning to shop for carpets later on in the trip. Guy wasn’t really pushy but after him serving us mint tea and laying out carpets after carpets of every size, design and color, it got awkward telling him we’re not buying after all. I was glad there were a good number of us to share the awkwardness with. If it was only me and Kim, I might have just swiped the card for the cheapest and smallest one. If you have plans of buying, they accept credit cards and can arrange shipping. We wanted to buy scarves though for the Saharan tour and we knew it’s going to be more expensive at the desert. We bought a couple for just 50 dirhams each at a shop by the exit of Tinghir and the shopkeeper demonstrated how to wrap it on my head the Berber way. I liked it too much and totally clueless redoing it on my own I never took it off for the rest of the day. 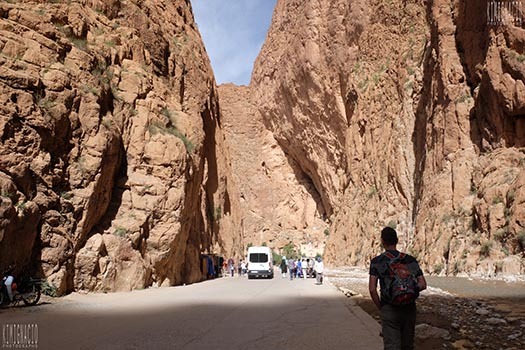 From Tinghir we boarded the bus back and proceeded to the canyons of Todra Gorge. It was very pleasant to stroll along the crystal clear river and it was just beautiful with the valley softly illuminated with the morning light. 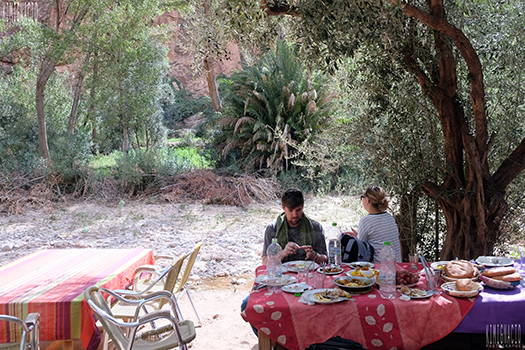 My favorite though was lunch under the shade of olive trees set up by the rocky river. We had the freshest salads, bread, kofta and grilled chicken. 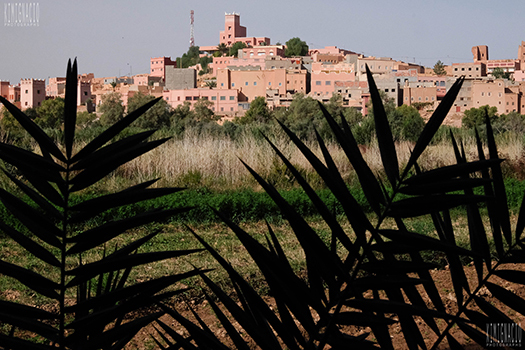 It was a long drive from there to Merzouga and I mostly napped on the way. 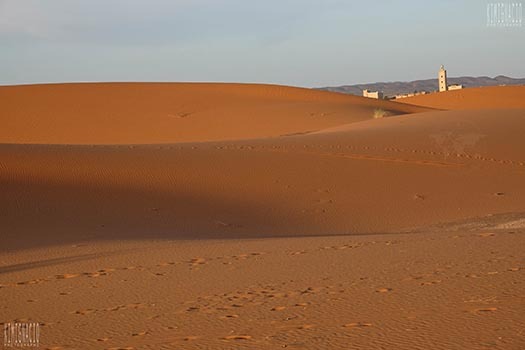 When I woke up, the vast dunes loom on the horizon. 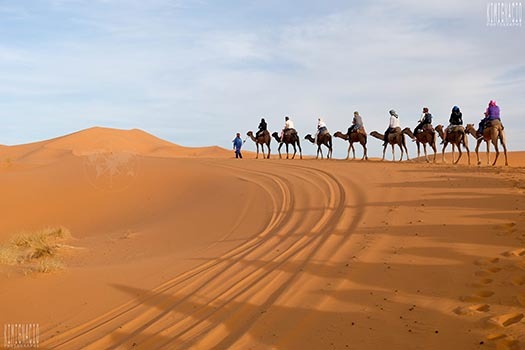 Before sun down we reached the desert and came face to face with the towering mounds of the Sahara. 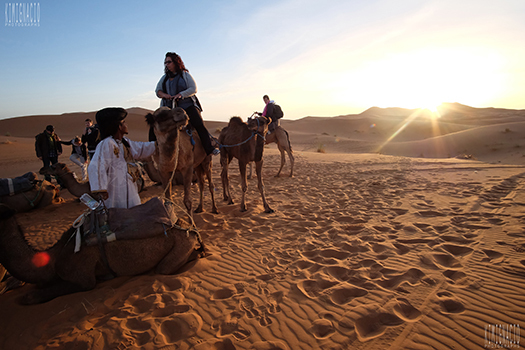 Camel ride in the Saharan desert at sunset sounds utterly romantic. In reality, my cute bum was sore! I was glad when after an hour and a half I saw our tents and we were told to get off our camels. The camel parking though was littered with poo and there’s no way avoiding stepping on them. 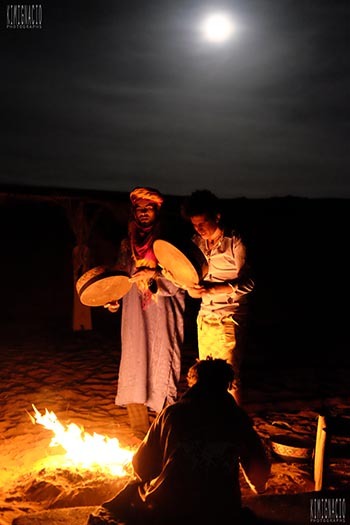 Our camel guides treated us to a folkloric entertainment post a chicken tajine dinner. Our only light came from the full moon and the bonfire. There were lots of dancing, singing and drum beating. When the embers died down and it got too cold, we slipped back into the tent and passed out immediately. That night we slept like nomads on a tent furnished with hand woven thick rugs and mattresses on the floor. It was bitter cold and was pretty basic with not even a toilet you just have to do it “behind the dunes”. 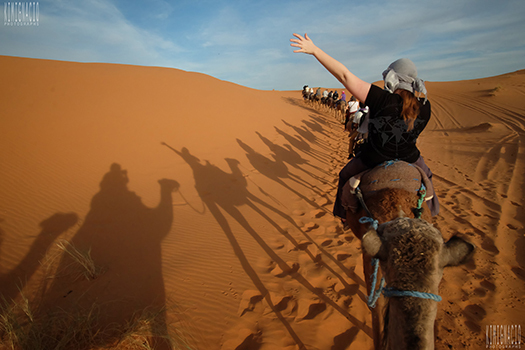 But that was definitely one of the highlights of any Moroccan trip! Catching the sunrise means getting dragged out of bed sometime at 4 AM but to watch it rise behind the dunes is magical. Breakfast and coffee awaits us at the town at the foot of the desert. Most members of our group were going back to Marrakech but we have teamed up with our favorite Canadian we adoringly nicknamed Mr. Fancy Pants and made arrangements to hire a private car to head to the city of Fez some 7-8 hours away.